The past several decades have seen profound changes in the political landscapes of advanced industrial societies. This volume assesses key political developments and links them to underlying socioeconomic and cultural forces. These forces include the growth of a well-educated middle class, the moderating of bipolar class divisions between wealthy capitalists and struggling workers, and the accelerated rise of new media technologies (especially television) as potent tools shaping the terms of public discussion. 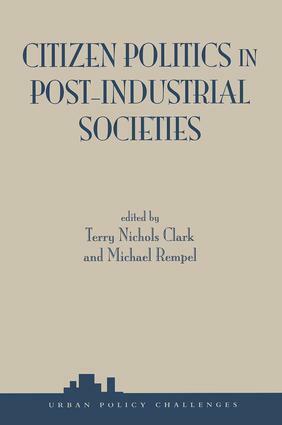 Related political transformations include the spread of new social movements on feminist, environmental, and civil liberties issues; economic concerns focusing more on growth, taxes, and middle class programs than on redistribution; the fracturing of core left and right political ideologies; and the growing centrality of electronic media as carriers of political opinions and rhetoric.In their introduction, Terry Clark and Michael Rempel pull together many seemingly disparate political changes to construct a clear, synthetic framework, identifying eight core components of postindustrial politics. Part Two examines shifts in underlying cultural values. It features a lively exchange between different contributors over whether apolitical, materialistic values have risen or declined since the 1960s. Part Three offers an in-depth look at the political views and party allegiances of the growing middle classes and Part Four examines some of today's most divisive issues.Although primarily adopting a cross-national perspective, Citizen Politics in Post-Industrial Societies includes several case studies of politics in the United States and one in Japan. Unique in its synthetic vision, this volume will stimulate and challenge readers from across the political and theoretical spectrum.